We are one of the largest and most popular dental practices in Brampton and nearby areas. With years of experience under our belt and several prestigious awards adorning our sleeves, nothing satisfies us more than the happy smile of a patient. Our key to success lies in the informal and friendly communication with our patients prior any treatment. Our forte is the state of the art equipment and the latest dental technologies available, so that we can provide the best dental and health care services to our patients. To avoid any compromise with the health and safety of our patients, our experts undergo rigorous training at frequent intervals to get well versed with the modern techniques of dentistry. 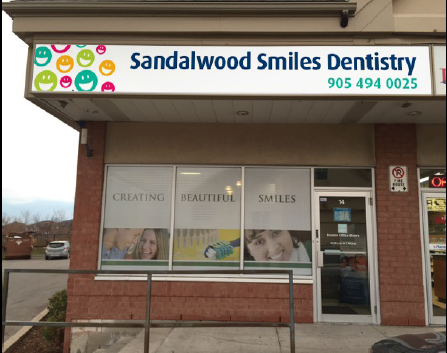 Sandalwood Smiles Dentistry– Best dental clinic I have ever been to. Whenever I visit the clinic, I just relax as I know I am in the right hands. The clinic is very hygienic, pleasant and the services are copacetic. Dr. Jakhu is very gratifying and knows her expertise. For patients like me who fear dental treatment should surely consult her at least once. I recommend her to everyone who desire best & value for money treatment. The fees (expense) too are worth the services. After visiting your practice, I was so impressed with how friendly the staff were, from the receptionists to the nurses and dentist I saw EVERY single one of them had bright and friendly characters. I now have the smile I always wanted, when I’m out with my friends they say I’m so much more chatty and full of life, no more do I have to keep my mouth closed in embarrassment. I hope you can continue to change the lives other patients like you did with me. I’ve had general checkups, teeth cleaning, and preventive care. The dentists are great and really explained things well, and the hygienist was gentle and thorough. I’d recommend Sandalwood Smiles Dentistry 100% over anyone else.